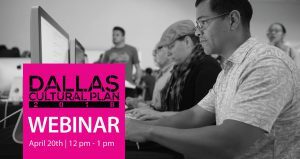 Join us for a discussion about running a mid-size arts organization in Dallas, part of the Dallas Cultural Plan 2018. 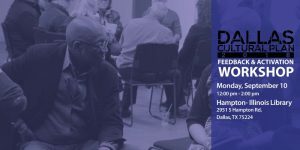 We will discuss the opportunities and barriers to working in, owning, and/or running a small arts organization in Dallas. 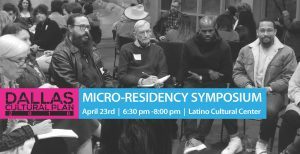 All those invested in mid-size arts organizations in Dallas - with a budget of $250,000 to $1,000,000 - are encouraged to attend. 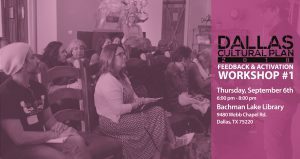 Join us to Activate Dallas' Cultural Plan! 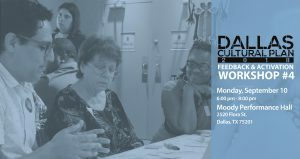 Please join the Office of Cultural Affairs and the Dallas Cultural Plan team to review and discuss the priorities and strategies for the Dallas Cultural Plan 2018. Comment on the Priorities, review and workshop the strategies developed by Dallas residents and the OCA, tell us how you want to bring this plan to life! 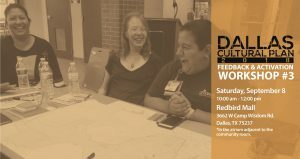 Join us to Activate Dallas' Cultural Plan! 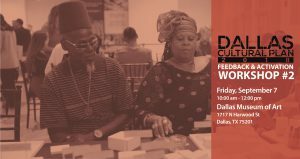 Please join the Office of Cultural Affairs and the Dallas Cultural Plan team to review and discuss the priorities and strategies for the Dallas Cultural Plan 2018. 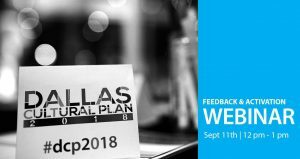 Comment on the Priorities, review and workshop the strategies developed by Dallas residents and the OCA, tell us how you want to bring this plan to life! Free parking is available at the museum.